2. I read Selfors' Smells Like Dog (linked to my thoughts) and rather enjoyed it. I'm generally inclined to like middle grade fiction because it provides adventure without including teenage romance (which I always find ridiculous). I'm quicker to pick up a piece of middle grade fiction to pass a few pleasant hours then I would many other genres. That's due in part to the fact that middle grade fiction doesn't require much (usually any) effort on my part, as an adult reader. Well written pieces of middle grade fiction provide a nice little bit of entertainment just when I want it. Then too, I like reading it in advance of my own children. I'm stocking our home book shelves with books for them to read as they progress as readers and so I'm quick to take opportunities to check into new stories. 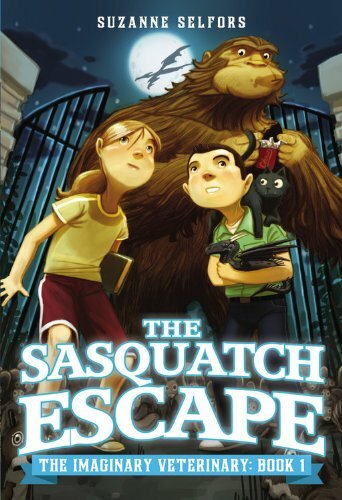 I opened the pages of The Sasquatch Escape ever hopeful to find a book that not only I would enjoy but that my kids would in turn. It should be noted that The Sasquatch Escape is the first in a new series entitled "The Imaginary Veterinary." This book sets the stage for the books to come, while offering a small adventure to whet the reader's appetite for more. In this story we meet Ben Silverstein who has been sent by his parents to live with his grandfather in the podunk town of Buttonville. The residents of Buttonville are dying out and there's not a whole lot of action to be found outside the local senior center. Buttonville used to be a hubbub of activity until the main source of employment - the town's button factory - closed down. Ben is not excited about spending his summer here, away from his parents and friends in LA. Furthermore, he's a little concerned because his parents have sent him to Buttonville for the expressly stated purpose of "working out some problems" between themselves. He feels angry and bitter about being shipped off and his hopes are not high that a good time will be had. However, immediately upon arriving in Buttonville he discovers a baby dragon, a quirky girl named Pearl, and the existence of a Dr. Woo who has recently taken up residence in the boarded up button factory. As it turns out, Dr. Woo is a veterinarian to imaginative animals who come from imaginative worlds. She doctors things like unicorns, griffins and the legendary Bigfoot. Perhaps, just perhaps, life in Buttonville will not be boring after all. As I say, this first book sets the stage for the up-and-coming titles. From this particular book you can guess at what adventure Ben and Pearl have in this story. You do get an adventure but at the conclusion you feel sort of as if you sad through Part I of III of The Hobbit - you know there is more to come and you wish you could just get to it already! (Patience is a virtue most easily admired in other people.) Alas, we wait. As an adult reader, I enjoyed the book so-so. It is an interesting and creative plot. Selfors writes in a manner that is not choppy or jarring. I think she writes banter in conversation very well and I could easily see and hear Ben and his grandfather conversing with one another in my mind's eye. It's a fast read and clever enough. (Not brilliant, but not boring!) Of course, you can see that Ben's parents have some issues to work through but as Ben has been removed from their conversations (arguments?) so is the reader. You know there is a problem but you aren't made to endure it, for which I am grateful. The entire time I was reading it I kept thinking to myself that my oldest would really rather enjoy this story and so I handed it off to read to him at his leisure and choosing. I'm perfectly fine with him reading the story right now. Although he is a beginning chapter reader, he is flying through The Boxcar Children with speed and gusto and I think he can handle The Sasquatch Escape without much difficulty. There are illustrations on just about every page and all the talk of dragons and Sasquatch sightings is sure to keep him entertained. Is this book a masterpiece or a classic? No. Is it clean enough, fun, and an intriguing adventure? Yes. I feel very comfortable passing this off to my kids for the sake of a good time. And if anyone out there is tempting to think that this is fluff and I shouldn't encourage my children to it, well, then I'd say that sometimes it's ok to relax with a quick and pleasant read. We're reading plenty of other books most 6 year olds don't get to for some time - things like The Hobbit, Narnia and E. Nesbit. I think we can handle a Bigfoot thrown in every now and again. On that note, I shall look forward to seeing how this series plays out. Thanks to LB-Kids who sent a copy of this book our direction in exchange for our honest thoughts. This sounds like a fun fluff read! Thanks for the review! I love that you used the word "podunk".